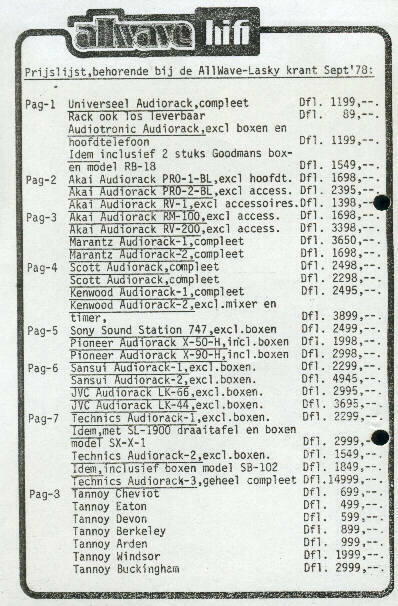 The above list is from the official Dutch distributor in the 1970's: 'Enga Sound' in Haarlem Holland. This company was owned by Mr. Endenburg. He designed the legendary 3KF cabinets with 3 Fane speakers and a HQ crossover. Many audio-nerds remember the IonoFane and the Kelly Ribbon. The 3KF could be equipped with one of these legendary tweeters. The prices on the list were the distributor prices from 1971, the amounts shops had to pay, consumers prices were 30 % higher. 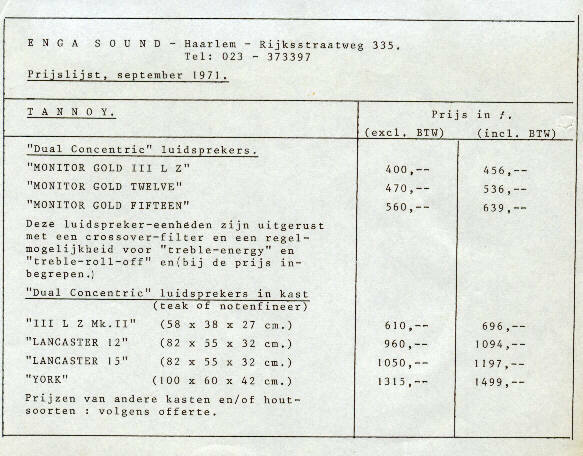 Below you see the pricelist of an audio shop in Leiden Holland: Allwave. These are consumer prices. Allwave was a big shop who imported many brands parallel to the official brand dealers. So this shop could offer many audio gear below official prices. In case of Tannoy this was impossible as Tannoy did not allow parallel imports. These are Dutch pricelists. Currency is in DFl. Indication on exchange rates: DFl. 1 ~ 0.5 € ~ 0.5 US$. © Hans Hilberink PE1MMK ® Radiomuseum. last update: 15-03-2002.